“On The Go” is a series dedicated to helping you stay low-carb/keto while out and about and on the go! 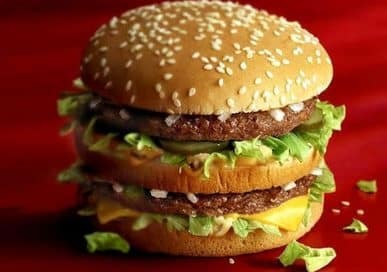 This article focuses on keeping you keto at McDonald’s. McDonald’s is an American fast food company, founded in 1940. Originally, it was a restaurant operated by Richard and Maurice McDonald, in San Bernardino, California. They restarted their business as a hamburger stand. In 1955, businessman Ray Kroc joined the company as a franchise agent. He proceeded to purchase the chain from the McDonald brothers. McDonald’s is the world’s largest restaurant chain, serving over 69 million customers daily. Although McDonald’s is known for its hamburgers, they also sell cheeseburgers, chicken products, french fries, soft drinks, milkshakes, wraps, and desserts. Let’s take a look at the top three items you can order (and how to order them) from McDonald’s that will keep you on the straight and narrow when it comes to a low-carb or keto lifestyle while on the go. You can easily order any of the hamburgers listed on the menu without a bun. Keep in mind, due to the processed nature of their cheese slices, any burger with cheese at McDonald’s will have hidden carbs. It’s best to always stick with the basics when ordering a hamburger as the toppings and extra “bits and pieces” can quickly add up to a lot of carbs. If a hamburger strikes your fancy while being keto at McDonald’s, then here’s the easiest thing to order. You can always order multiple burgers if two burger patties aren’t enough to satisfy your hunger. To make burger nutrition simple, the nutritional info will be as follows for two patties and one slice of cheese. You can easily do the math on this if you are eating more than one. The absolute easiest way to keep the carbs low at McDonald’s is to have a burger without the bun. It’s also important to keep the component of the cheese in mind as well, as it adds 2g of carbohydrates per slice. In our opinion, this is the best menu option for a fast and easy way to stay keto at McDonald’s. Side salads are a drop-dead simple menu item at McDonald’s. The salad isn’t the biggest you’ve ever seen, but its cheap and is probably one of their healthier menu options. It comes (generally) with two cherry tomatoes, a carrot slice or two, and the rest is lettuce. Add some of the dressing (read not the entire packet) and you’ve got a pretty tasty salad on your hands. Be very careful with this step. The packet of ranch dressing you will get has 11g of carbs for the entire packet. We recommend using a small amount (around a spoonful) to reduce the carb count significantly. Also, keep in mind this will lower the fat and calorie content, so eating a side salad by itself is definitely not going to be a filling meal. The Artisan Grilled Chicken Sandwich is pretty simple. It’s one of the sandwiches McDonald’s created to try and revive their “healthy” side of their food business. 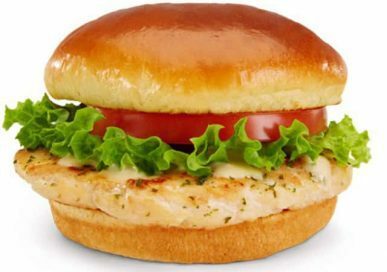 The original sandwich is grilled chicken on a bun, topped with tomato and lettuce. Instead of adding mayo to the sandwich for more fats, opt for the creamy ranch sauce which adds fats and only 1g of carbohydrates. The mayo is highly processed and actually adds a decent amount of carbs in something that really should only add fats. These are what we would consider being the top three best choices while eating on the go at McDonald’s. So many items on their menu contain bread and have added sugars, making them unfit to eat on the keto lifestyle. Please keep in mind, there are other menu combinations that will achieve this goal as well. Have an ordering/food combination you think works well for keto at McDonald’s? Let us know in the comments!